Are you a young musician interested in developing your skills in jazz and improvised music? We invite you to come and work with some of the UK’s finest jazz musicians as part of our brand new Lancashire NYJO Regional Academy. Based in Preston with sessions every half term, the Academy will be full day workshop with a NYJO Leader and a team of NYJO Young Ambassadors. 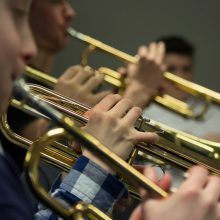 The sessions will mainly focus on small band and improvisation skills, complementing the excellent county jazz orchestra opportunities we have in the county. The Lancashire NYJO Academy aims to cater for both intermediate and more advanced musicians and we welcome any instrument (including voice). You will need to be aged 18 or under and, to get the most out of this opportunity, we would recommend you are a minimum of grade 3/4 standard on your instrument (this is only a guide and recognise that many musicians don’t take formal exams). This is part of NYJO’s aim to ‘level the playing field for jazz education’ so that young musicians from across the UK have equal opportunities to develop their talents. There is also a NYJO Academy starting in Cumbria as well as existing academies in Wiltshire, Darlington and London. If you would like any further information, please email cath.sewell@lancashire.gov.uk.